Explore through the dusty debris and cultural heritage of the town of Hospet in Karnataka. Locally known as Hosapete, the town is snuggled on the banks of the river Tungabhadra. This little town is of immense historical significance and subsists from the time of the reign of Krishna Deva, who ruled Vijayanagara. What makes Hospet a tourist hotspot is its archaic monuments of the by gone era that never fail to astound you. Get to the heart of the town and do not miss out on the must-visit places that we have listed out. By Air: The closest airport to Hospet is located in Bellary, which is at a distance of about 75 km from the town. By Rail: The Hospet Railway Station is located at the heart of the town. The station is well connected by trains from all the major cities of the country. By Road: Buses ply regularly from Hospet to all the near-by cities and towns of the state. The bus junction of Hospet remains quite busy as it is well connected to other parts of the country. The best time to visit Hospet is in the months of September to February when the weather is pleasant with an average temperature of 15°C to 34°C. Constructed in the year of 1953, the Tungabhadra Dam stands tall on the Tungabhadra river, on the banks of which the town Hospet is nestled in. One of the most important dams of the state of Karnataka, the dam is utilised by the locals for irrigational purposes. Apart from generating electrical power supply, the dam also effectively controls flood in the region. The reservoir is a popular tourist destination and is home to a lot of wildland with an abundance of aquatic fauna. With its striking milieu the dam also boasts of many exotic species of birds like flamingos, pelicans and so much more. The Virupaksha Temple is the finest architectural marvel that stands today in the town of Hospet and is of historical significance. Marked by UNESCO as one of the most renowned World Heritage Sites, the temple houses a sanctum, a pillared hall, ante-chambers, gateways to the entrance, a courtyard and smaller shrines. 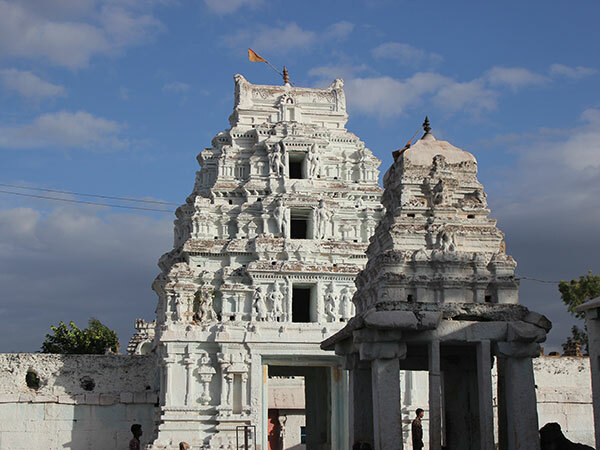 Dedicated to the Hindu mythological figure of Lord Shiva, the temple has a nine-tiered, 50-metre-high gopuram, is situated on the southern bank of the Tungabhadra river at the foot of the Hemakuta Hill. The most interesting fact about the temple is that it is fashioned in such a way that the river Tungabhadra would flow along its terrace, then flow down to the kitchen and then eventually find its way towards the exit. Replete with some brilliant and outstanding craftsmanship of the artistic sculptures adorning the walls and gateways, the temple makes for one monumental marvel to look at. The Archaeological Museum in Hospet makes for a must-visit when in town; it is a popular tourist destination for the tourists and the travellers alike. The museum boasts of a striking collection of various unique artefacts along with ruins of unusual sculptures and idols. It is said that in the year of 1972, these artifacts were brought to the museum. The museum houses four huge galleries boasting of arms and other metal items. From brass plates of historic significance to excavated stucco figurines of iron and porcelain, the museum is a history buff's Disneyland. The Lotus Temple, nestled amongst ruins and debris, was once a part of the Zenana enclosure, which during the Vijayanagar empire, is the place where queens and other women of the royal household used to live. The Lotus Mahal, otherwise known as Kamal Mahal or Chitragani Mahal by the locals, is named so because of its unique structure, as its structure represents that of a lotus bud. With elaborate archways fashioned in the shape of lotus petals and the central dome in the shape of a lotus bud, the architectural design has both Indian as well as Islamic influence. Pay a visit to this architectural marvel when in town and witness the sheer grandeur of the monument.